I firmly believe that the majority of people in the world are good people who want to do good deeds. Different people in the world have different levels of skills, competencies, abilities, and capabilities. A person with low competencies can have the utmost good heart and soul. These are people who want to do good work, but might not have the specialized skills and knowledge to provide a greater level of work. In fact a person with good intentions who is incompetent could do serious harm. Here is an example: imagine a person with great intentions has no concept on how to fix computers. This person starts a computer repair shop. This person goes to work on a computer by seeking information online and accidentally downloads a virus to the computer. Now the computer is in worse condition because of the well-intention, but incompetency. This good-heated person wasn’t trying to do harm to the computer. A license demonstrates that an individual has met minimum competencies in a state to practice a profession. What about Recreational Therapy and Licensing? Recreational therapists provide services for people with illnesses and disabilities. Recreational therapists are required to have a license to practice in four states (North Carolina, New Hampshire, Oklahoma, and Utah). Recreational therapists in these states must have met minimum competencies to practice their profession legally. The license isn’t created to protect the Recreational Therapist’s job. The #1 (and only reason) a license is put in place to protect the public and people who receive recreational therapy services. The license prevents a well-intentioned person who lacks training and experience from inadvertently causing harm to a patient. Here is a fictional example: A teenager had an accident and disclosed a shoulder. The teen has received physical therapy to increase range of motion. the teen is educated that she may no longer be able to play sports like softball that require her to pull her arm back to pitch because the shoulder may slip back out of socket again. Chances of the should re-dislocating increases more after each time. Let’s imagine a well-intentional unlicensed recreation therapist decides to get her playing softball again as soon as possible. The rec therapist has her pitching and catching during rehabilitation. The rec therapist (in this case) is a good person with great intentions, but lacks any experience or training in providing rehabilitation services. Unfortunately, her shoulder dislocates again while she is in treatment (ouch). The licensed is put in place to protect people (patients, clients) from harm. 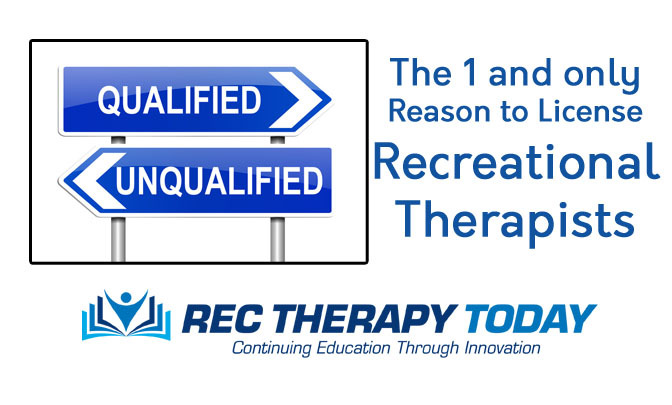 Licensed rec therapists can go above and beyond and earn certification in specialization areas through the National Council for Therapeutic Recreation Certification in these areas: physical health and rehab, pediatrics, behavioral health, adaptive supports, geriatrics, or behavioral health. Want to stay updated on Rec Therapy! The “harm” may not even limited to physical injury. Injury also stems from needlessly consuming a consumers resources (ie: using approved therapy visits without achieving the anticipated outcome, or worse, exacerbating his or her condition.) Harm can be emotional by chipping away at self-esteem and confidence. Harm can also be the absence of needed interventions that actually would have made a difference such as progressive community Reintegration and activity modification. All these examples protect the public/consumer, and each gives strong justification for RT licensure.